Bhubaneswar : The dependency on LPG after Ujjwala Scheme seems at higher rate. But little that, many know that, still majority of Rural India uses fire wood for cooking purposes. Causing threat to the environment and constant health hazards it’s quite possible and also evident that LPG is like a day dream for many difficult terrains in the state. Name it Koraput, Malkangiri or Kalahandi or even Nayagarh, the dependency on forest for fire wood unlikely quite high. Causing threat to our forest cover and also indoor pollution is a major setback. This leads to threat for the health of mother and children. According to a recent report by The Down to Earth, the number of households using LPG connections under the Ujawala yojana is 1383035 where as the number of households that use firewood for cooking are 6,219,411 which is nearly five times more, This indicates why we need a comprehensive approach for promoting clean cook stoves, said Dr Birupakshya Dixit, India Programme Coordinator, Practical Action. Among other, Mr Sanjit Behere, Senior Energy office, Practical Action, Mr Prashant Biswal from PAC and Mr Nitin Akhade from CLEAN highlighted the issues related to clean cook stoves in Odisha and India. Mr Nitin said, the data available around clean cook stoves and use of traditional chulahs indicates the need of a dialogue over the issue and bringing some solutions. 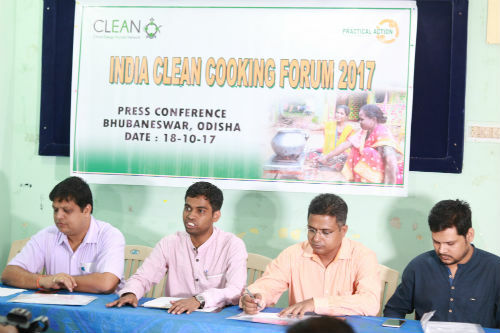 On such a topic of national interest, Odisha is going to represent at India Clean Cooking Forum 2017 in New Delhi. CLEAN (Clean Energy Access Network) a civic body at national level promoting the use of Clean cook stoves is organising the 5th edition of the India Clean Cooking Forum (ICCF) on 24-25 October at India Habitat Centre, New Delhi. This year’s event will be in partnership with the Clean Cooking Forum of the Global Alliance for Clean Cook stoves, which will mark the international presence of the issue. The use of firewood and agricultural residue, dung cake and coal/charcoal as fuels in traditional cook stoves poses a significant health risk, particularly to women and children due to exposure to high levels of indoor air pollution resulting from incomplete combustion and inadequate ventilation. The past three years witnessed an unprecedented and near-exclusive focus on LPG expansion through first the ‘Give it Up’ campaign, and then the ‘Ujjwala scheme’. However, clean cooking cannot be considered as achieved just by providing an LPG connection. The sector faces many challenges, which will be the focus of discussions during ICCF. In spite of LPG reaching the last mile due to massive government push, growth in its consumption and its transition is not complete. Need not to forget the rising subsidy burden and import dependency for LPG are posing challenges for government to fast track their efforts in delivering the LPG based solutions. Based on the recent survey still 50-60% of Indian rural households are continuing to use traditional fuels for cooking as of 2016. Government is actively pushing for reforms in clean cooking by considering the multi fuel approach rightly highlighted in draft National Energy Policy released recently by NITI Aayog. Other major point of the discussion around the clean cooking would be one size does not fit all. This implies given the culinary diversity of India, a range of cooking energy solutions will be needed. Cooking energy solutions for a household must meet a range of cooking and other heating needs. A multi-criteria approach to assess cooking energy solutions is much required. In fact, it is the user or the cook who should be free to choose the option (or stack of options) that is best suited for her. Clean devices / connections are important but it is crucial is to monitor and ensure sustained use of clean options. Sustained focus on ensuring reliable and affordable supply of fuel refills, maintenance of devices (or connections) will be critical. Thus initiatives – by government, practitioners and others – should not be restricted to ‘connections’/ devices, but must to equally emphasise on reliable and affordable access to fuels (LPG refills, fuel pellets, biogas etc.) as well as on maintenance of devices. Given that cooking and its energy needs have a strong local flavour, the engagement of local government and non-governmental agencies will be important. Centralised policy making in this regard may be restricted to providing guidelines.